In a 1-1/2-quart slow cooker, combine the whipping cream, chocolate and orange liqueur. I added an extra splash of Amaretto to the semi-sweet chocolate fondue and Grand Marnier Natural Cherry Liqueur to the bittersweet chocolate fondue. It was a true hit with my friends!! I also served the semi-sweet fondue with an individual shots of Bailey's. We laughed as a few friends added a couple of drops of Bailey's in a bowl, spooned in the fondue on top then swirled it all together!! 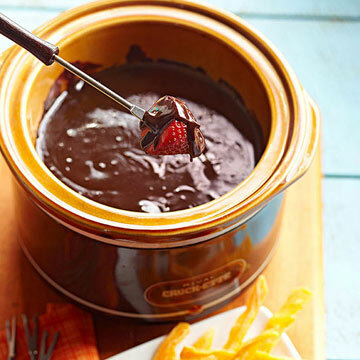 This is a quick and easy fantastic fondue recipe and it will definitely GROW your circle of friends!! !